This coming Friday, June 24th and Saturday, June 25th the annual Pine City Knapp-In will be held at the North West Company Fur Post , 1.5 miles west of I-35 at the Pine City exit. 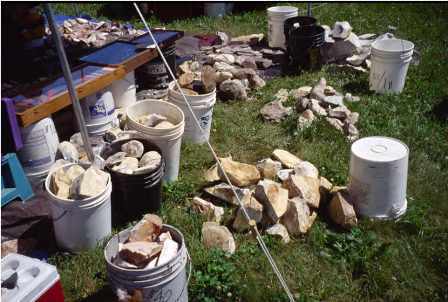 This annual event has been taking place for a couple of decades, allowing flintknappers, archaeologists, collectors, and the interested public a chance to see and discuss how stone tools are made. The event is co-sponsored by the North West Company Fur Post and the Minnesota Knapping Guild. 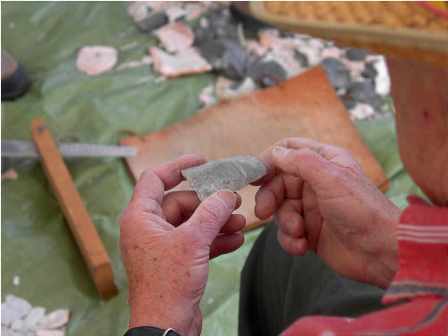 If you are a flintknapper of any skill level you are welcome to bring your equipment, and a chair, and join in. 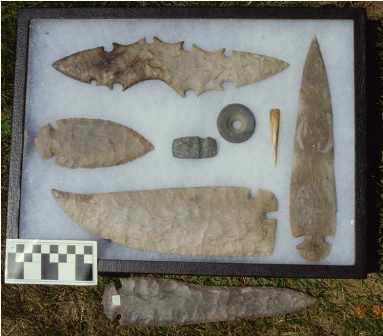 There are usually knapping tools and raw stone for sale. The public is encouraged to watch and ask questions and to bring artifacts they have found for identification. There is an admission fee to the site, but the Knapp-Inn is free. Bring your family and spend some time touring the reconstructed fur post and then sit a spell, and watch, and visit with the flintknappers. Yes Don, when I hear about the dates, I will add them to the events calendar and make a post about the upcoming Knap In. Please let me know when the Knapp inn will be this year. thanks! Jill, Knap In will be June 29 and 30, 2012.